Trump made his latest comments during a White House meeting with Baltic leaders. 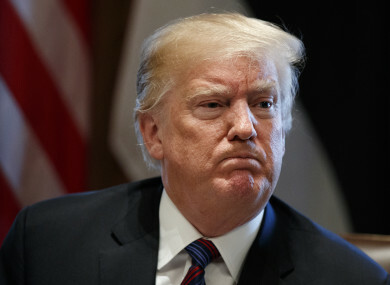 US PRESIDENT DONALD Trump has vowed to deploy the military to the border with Mexico, something he described as a “big step”. Cultivating his tough-on-migration image during a White House meeting with Baltic leaders, Trump said “we are going to be guarding our border with our military” as he lashed out at his predecessor. “President Obama made changes that basically created no border,” he claimed, without elaborating. “Until we can have a wall with proper security, we’re going to be guarding our border with the military. It’s a big step, we really haven’t done that before or certainly not very much before,” he said. Trump has raged at Mexico for allowing around 1,500 demonstrators from Central America to walk toward the US border. Like each of the last five years, they set off from the southern Mexican state of Chiapas for the US border, where many hope to apply for asylum. “If it reaches our border our laws are so weak and so pathetic… it’s like we have no border,” Trump said. “We need to have a wall that’s about 700-800 miles” of the border, he said. Email “'It's like we have no border': Donald Trump vows to deploy military to the US-Mexico border”. Feedback on “'It's like we have no border': Donald Trump vows to deploy military to the US-Mexico border”.